Looking for esoteric books? Biblio.co.nz hosts hundreds of of the finest online book stores and booksellers, including specialists in esoteric. Use the list below to locate a specific specialist bookseller or book store near you. Or, use the form below to search the inventory of all booksellers who specialize in esoteric. Esoteric, historical international Spanish sales. The private study & collection specialists of new, second-hand, out of print, rare & antiquarian books on Eastern & Western Philosophies, Occult, Psychical Research, Folklore, Mythology, Qabalah, Secret Societies, Witchcraft, Divination, Mind Sciences, Ancient Sites, etc. 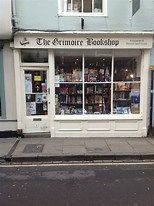 Othello's Bookshop9, Bevan Street EastLowestoftSuffolk.NR32 2AARare & Out-of-print general bookstore with over 15,000 books currently in stock.